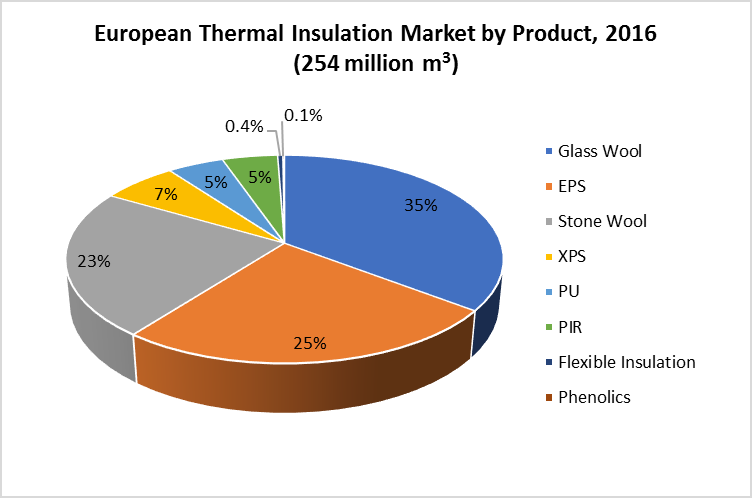 According to the study, the total market for thermal insulation products in Europe stood at 254 million m3 in 2016 (8.0 million t), with growth forecast at a CAGR of 2.5 % to 2021. This equates to an approximate market value of just under EUR 16 billion in 2016. The 2017 market is estimated at 259 million m3, a 2 % rise over 2016. 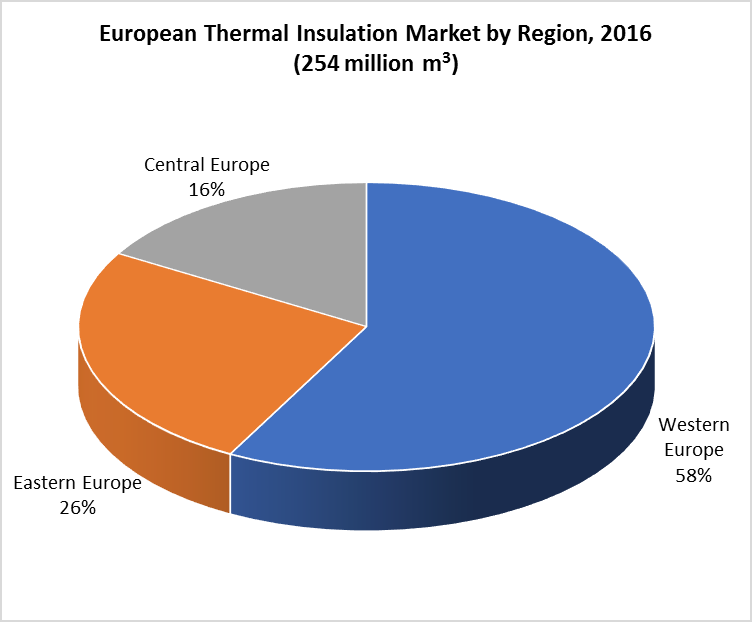 Western Europe accounted for 58 % of the European thermal insulation consumption, and the market is forecast to show modest growth at a CAGR of 2.0 % to 2021. Eastern Europe continues to drive growth with a CAGR of 4.2 % forecast to 2021, with Turkey the main driver due to heightened activity in residential construction. In Central Europe, the Hungarian and Romanian markets are also experiencing strong growth as both economies continue to flourish with increased expenditure to improve housing stock and infrastructure. Although the construction industry has remained relatively subdued since the financial crisis in 2008, concerns over improved energy efficiency in buildings and rising energy prices have boosted demand for thermal insulation materials. Regulatory authorities are highlighting the importance of minimising heat loss through the building envelope and are adopting legislation encouraging zero energy buildings. Retrofit construction is now also regulated and minimum energy performance standards have been set, which are a key driver for thermal insulation materials. Commercial and domestic buildings continue to represent the bulk of the demand at 86 % for thermal insulation materials in Europe, with the overall use in industrial applications remaining considerably smaller at 14 % of the market. Glass wool and stone wool are well established in the market – combined, they represent 58 % of the European thermal insulation market. Manufacturers are promoting their ‘natural’ fire protection characteristics and lobbying against the use of other plastic foam insulation materials, especially EPS. Whilst EPS remains a very popular material in external wall insulation in much of the region, EPS consumption in many Western European countries has started suffering because of its behaviour in the case of fire. This is not necessarily the case in Eastern Europe, where the lower price of EPS continues to favour its use in construction. Tougher requirements demanded for thermal insulation materials are increasing the thickness of these materials. Polyurethanes offer a competitive advantage as, compared to other materials, thinner thicknesses are required to produce similar insulating properties. 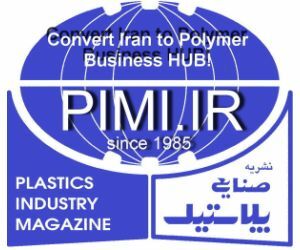 “The European Market for Thermal Insulation Products” is available from IAL Consultants. Prices start at EUR 1,100 for single country volumes, the whole report is priced at EUR 8,000.